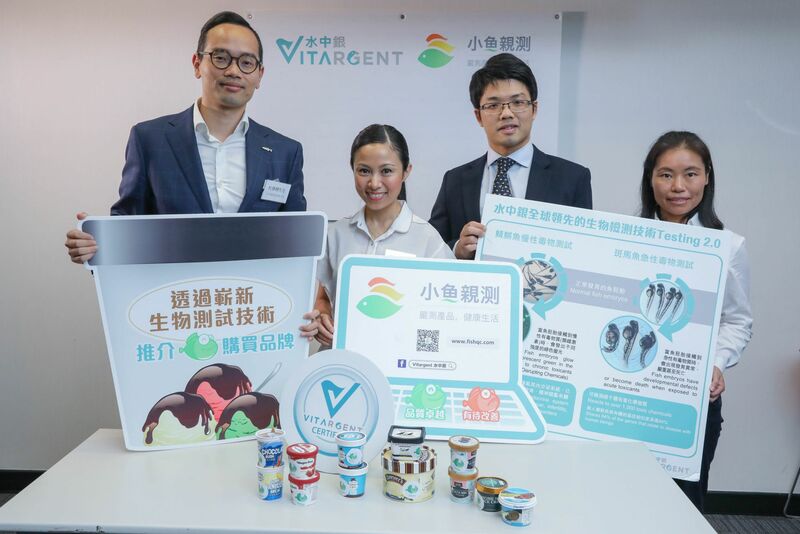 (Hong Kong, 21 September 2017) Vitargent (International) Biotechnology Limited (“Vitargent”) published test results of 29 popular ice-cream products under 9 brands available in the market on its Test-it™ information platform (www.fishqc.com). Known for its safety examination of cooking oil, BB cream, instant coffee and sunscreen, Vitargent has applied the “transgenic medaka” and “zebrafish” embryo toxicity testing technology, which is unique in the world and developed by Hong Kong scientists. The safety test rated 12 samples as Green Fish (excellent), 7 samples as Yellow Fish (basic) and 10 samples as Red Fish (sub-optimal). Although the food additives in the samples as shown on the product labels followed the recommended usage of various countries, in Vitargent’s test using the global leading bio-testing technology Testing 2.0, the fish embryos exhibited abnormal development or died in some cases when exposed to certain ice-cream samples. This indicated that such samples contained toxic substances which traditional testing technology failed to detect. Hence, consumers are recommended to choose brands that are safe to buy and those that have passed the “Green Fish” triple test. Ice-cream is a popular and refreshing treat in hot summer. Recently, a story about an ice-cream that did not melt under the sun for five straight days made international news and got people surprised and worried about the negative impact of additives in ice-cream on their health. Meanwhile, consumer awareness was raised as the Centre for Food Safety found that a few local ice-cream parlours were selling products with an excessive total bacterial count. In view of such, Vitargent purchased 29 ice-cream products from major supermarkets (Yata, PARKnSHOP and City’Super) and 7-11 convenient stores in Hong Kong for fish embryos toxicity tests in May 2017. Samples tested include products from 9 world-renowned brands such as Nestle, Haagen-Dazs, Dryers, MOVENPICK and LILY & RAN. Among the 29 ice-cream samples, Test-it™ rated 12 samples (41%) as Green Fish (excellent), 7 samples (24%) as Yellow Fish (basic) and 10 samples (35%) as Red Fish (sub-optimal). In terms of price, among the 29 samples collected, the average price is 20.3HKD/100mL. The most expensive one costs 30.4HKD/100mL, which is around 12 times of the cheapest one that costs 2.7HKD/100mL. Among the nine samples that cost more than 21.7HKD/100mL, five samples (56%) were rated Green Fish and four (44%) were rated Red Fish. All in all, most low and mid-priced ice-cream products had unsatisfactory safety performance, with less than half of them rated Green Fish. Despite such, given that a high percentage of expensive ice-cream products was also rated Red Fish, the price may not be the most important consideration when purchasing ice-cream. In terms of brand origins, Vitargent selected products from Hong Kong, Japan, Switzerland, the USA and New Zealand. Among the nine samples of Hong Kong brands, four (45%) samples were rated Green Fish, two (22%) were rated Yellow Fish and three (33%) were rated Red Fish. Among the four samples of Japanese brands, one (25%) sample was rated Green Fish, two (50%) were rated Yellow Fish and one (25%) was rated Red Fish. Among the five samples of Swiss brands, three (60%) samples were rated Green Fish, one (20%) was rated Yellow Fish and one (20%) was rated Red Fish. Among the eight samples of USA brands, three (37.5%) samples were rated Green Fish, two (25%) were rated Yellow Fish and three (37.5%) were rated Red Fish. Among the three samples of New Zealand brands, one (33%) sample was rated Green Fish and two (67%) were rated Red Fish. For the place of manufacture, over 60% of the samples were from Hong Kong, and the rest were from France, Switzerland and New Zealand. Out of the 19 samples manufactured in Hong Kong, eight (42%) samples were rated Green Fish, five (26%) were rated Yellow Fish and six (32%) were rated Red Fish. Out of the four samples manufactured in France, two (50%) samples were rated Green Fish, one (25%) was rated Yellow Fish and one (25%) was rated Red Fish. Out of the three samples manufactured in Switzerland, one (33.3%) sample was rated Green Fish, one (33.3%) was rated Yellow Fish and one (33.3%) was rated Red Fish. Out of the three samples manufactured in New Zealand, one (33%) sample was rated Green Fish and two (67%) were rated Red Fish. In other words, ice-cream manufactured in Switzerland had the best safety performance than those made in other countries and cities, while products manufactured in Hong Kong are not particularly safe. Regarding the ingredients of ice-cream, Jimmy Tao pointed out that the most common additives found in all tested samples were guaran (also known as guar gum, found in 22 samples), locust bean gum (also known as carbo bean gum, found in 15 samples) and carrageenan (found in 15 samples), which were commonly used food emulsifiers, thickeners and stabilizers. When used in appropriate amounts in accordance with WHO regulations and national requirements of various countries, they would not cause health risks. According to Annie Lee, while it is important for parents to pay attention to the safety of ice-cream products for their kids, the elderly and pregnant women should never overlook the risks. The manufacture, transportation and freezing of ice-cream may increase the bacteria count of E. coli and Listeria. As pregnant women are especially prone to Listeria infection, it is recommended for pregnant women, kids and the elderly to avoid eating soft ice-cream and to choose high-quality and well-stored hard ice-cream. In addition, people who are allergic to milk solids and milk can select ice-cream made of yogurt to prevent causing stomach irritation and diarrhoea, as yogurt contains probiotics that play an important part in gastrointestinal health. Jimmy Tao reminded that the current safety analysis on food additives primarily focused on analysing the risks of a single ingredient and did not take into consideration the combined toxicity effects when such ingredient was mixed with others. Besides, the selection of ingredients, manufacture, transportation and storage of ice-cream might compromise food safety. Consumers can visit the website of the Test-it™ online consumer product safety information platform (www.fishqc.com) for information of “Green Fish” products that passed the screening of acute toxicity, chronic toxicity and banned ingredients, so as to enjoy safer shopping. ENVIRON HEALTH PERSPECT. 2012 JAN;120(1):1-5.